Increased participation in world trade is typically seen as the key to rapid economic growth and development. Since this work examines trade and development from the point of view of developing countries, it provides a rare opportunity to understand – and benefit from – the perspectives of the developing world. Developing nations comprise two-thirds of the membership of the World Trade Organization (WTO) so a work produced by an array of experts from those countries provides an important window on the intersection of trade and development. Since many of the topics covered in the work describe on-going progress in the WTO’s “development” or Doha Round, the book also helps readers to understand the context, issues and results of this important round of international trade negotiations. Part I. The WTO, Multilateral and Regional Frameworks for Trade. 1 . 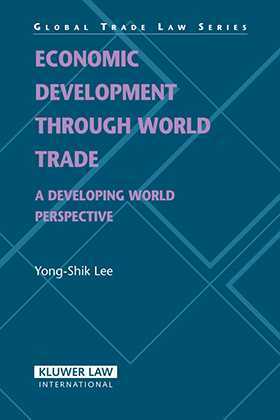 Development and the World Trade Organization: Proposal for the Agreement on Development Facilitation and the Council for Trade and Development in the WTO, Yong-Shik Lee. 2. A Reflection on the South–South Coalition in the Last Half Century from the Perspective of International Economic Law-making, An Chen. 3. The WTO, Democracy, and Development: A View from the South Bhupinder Chimni. 4. Liberalization of Trade in Services and Trade Negotiations, Alejandro Jara and M del. Carmen Dominguez. 5. One Year Since the WTO Hong Kong Ministerial Conference: Developing Countries Re-claim the Development Content of the WTO Doha Round, Faizel Ismail. 6. Trade Diplomacy and Development Clubs: The Interaction in the Americas, Diana Tussie. Part II Trade and Development: Cases of Seven Developing Countries . 7. Export Promotion and Economic Development: Korea’s Experience, Jai S. Mah and Jae-hee Kang. 8. The Evolution of China's International Trade Policy: Development Through Protection and Liberalization, Jiangyu Wang. 9. Liberalizing Border Trade: Implications for Domestic Agricultural Markets in India, Rajesh Chadha, Devender Pratap, and Anjali Tandon. 10 . Legal Reforms and International Economic Development: Iran’s Economic Development from a Global Perspective, Ali Z. Marossi. 11. EU Maritime Rules and Transport Sector Policy Reform in Turkey, Subidey Togan. 12. Trade Liberalization for the Second Largest Country in Europe: Going East, West, Or Can It Be Both?. Oleg Riabokon. 13. How Far Can LDCs Benefit from Duty Free and Quota Free Market Access? : The Case of Uganda, Francis Mangeni.